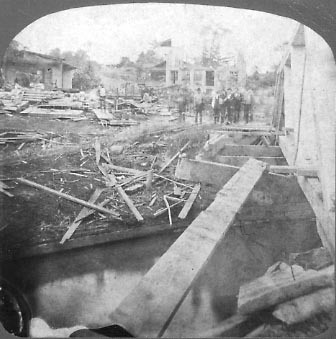 "Tornado At Portage NY July 4, 1876"
"Ruins of Stone Mill and Grocery Store"
George Washburn, Photographer, Catile N.Y.
On the day of America's Great Centennial hundreds of local folk gathered near the Cascade House at the "Centennial Grove" to celebrate the Nation's hundredth birthday. That afternoon the Portage area suffered from one its most disasterous storms. Although the celebrants at the Cascade House and Mr. Letchworth's Glen Iris was spared, the nearby town of Portageville was not as fortunate. The image above was taken shortly after the storm. For more information, see our Pieces of the Past featuring a newspaper account of the storm.